In tall, thin letters, this Holiday Alphabet design makes a great Christmas alphabet. Change the color, and you can use it throughout the year. 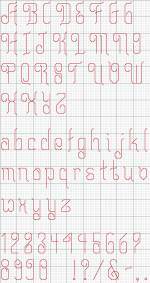 Very nice for monograms, too, and all done with easy backstitching! As a variation, you can close the gaps in some of the letters. Note the p, h, b and e, below, compared with their counterparts in the full alphabet. To make those letters, just add an extra stitch where appropriate, as shown in the words "Alphabet Stitch. There are also some alternate letters, for example, as shown by the t's in "Stitch." Click here or on the picture above for "Holiday," a printable PDF pattern. A new window or tab will open so you can continue here. "Holiday" Alphabet 24 manages to look festive and remain very readable. It works well for holidays, monograms or any application that requires a "simply elegant" look. When stitched on 14-count fabric using DMC floss, use 1 strand for backstitches. The upper case letters are 12 stitches high, with the tips of some letters extending above and/or below. The upper case letters vary in width. The majority of the lower case letters are 5 to 7 stitches wide. 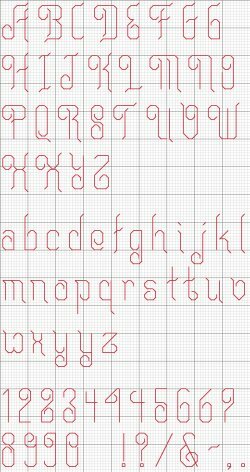 This is an easy to stitch alphabet that uses only backstitches. If this stitch is unfamiliar to you, click on the "Backstitch" button on the left menu, under the "Tutorials'" section. Click here for a printable cross stitch pattern for "Holiday".